Hello friends! 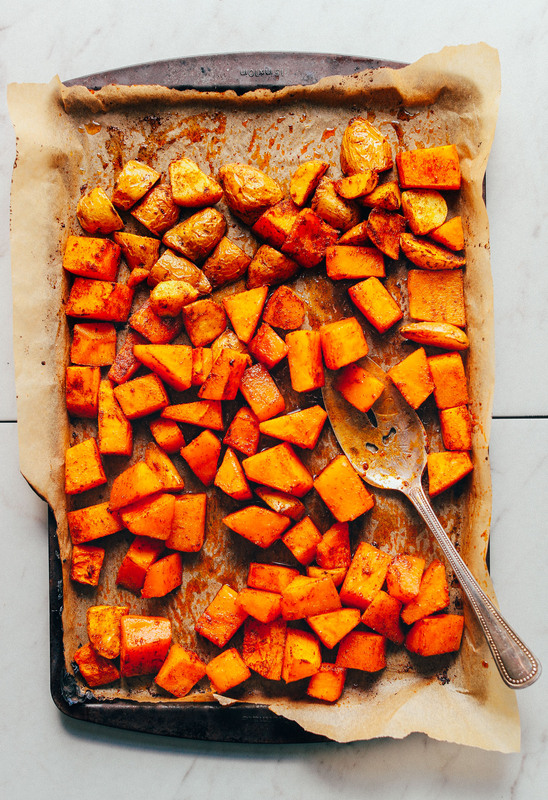 Consider this your step-by-step tutorial on how to roast vegetables (with and without oil)! 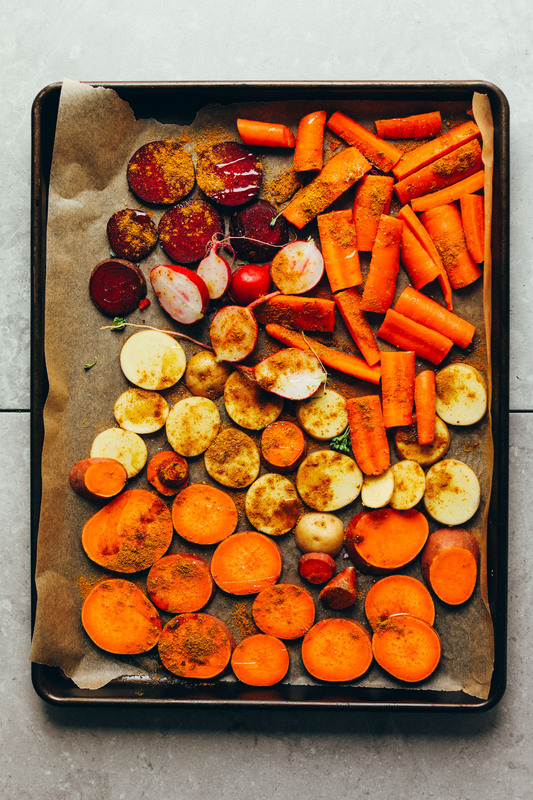 We believe roasting vegetables is a basic cooking skill that everyone should know. Not only is it useful year-round, but it’s also a quick and way to feed yourself a variety of ways. In addition to the roasting method, we also included 6 delicious and easy ways to put them to use so you can feed yourself and those you love! Check out the video below to see what we mean, or skip down to the recipe to learn all about the roasting process! A step-by-step visual tutorial on how to roast vegetables of all kinds (with and without oil), plus 6 delicious ways to put them to use! 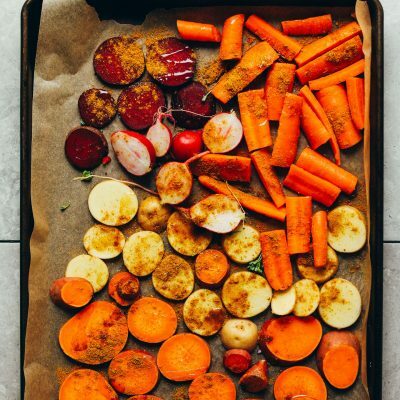 Preheat oven to 400 degrees F (204 C) and prepare 1-2 large baking sheets (depending on how many vegetables you're roasting) with parchment paper or a non-stick sheet. 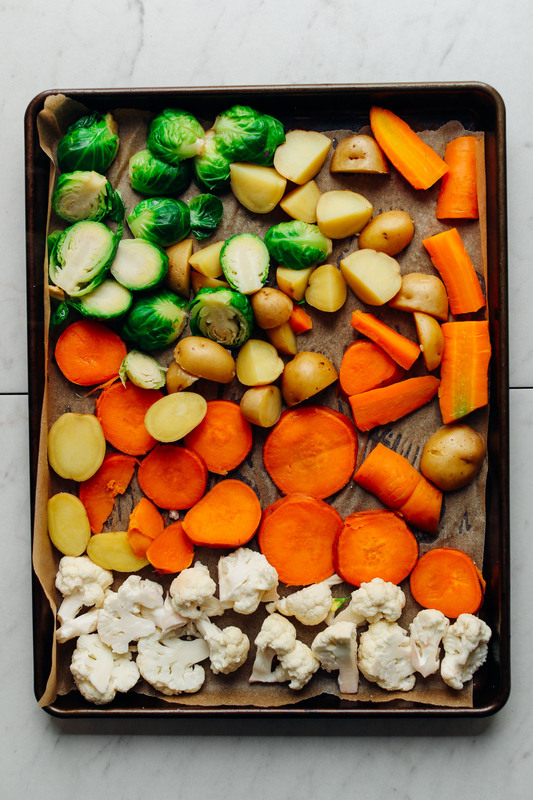 Follow the tips above to prepare vegetables for roasting by rinsing as needed, peeling as desired, and slicing/piecing into bite-size pieces. Peeling the garlic is optional - it can be roasted peeled OR with the skin on. Add vegetables to the same baking pans according to their required cook time. Root vegetables (beets, carrots, potatoes, etc.) generally tend to take longer (up to 40 minutes), so I like to group them together so they finish baking at the same time. Cruciferous vegetables (like cauliflower, broccoli, and cabbage), as well as garlic and onion don't tend to require as time to cook (~25 minutes) so we recommend grouping them together on a separate pan so they finish baking at the same time. Once on the pan, drizzle with a little oil to coat (see this method for oil-free! ), a pinch of salt, and desired seasonings of choice. We prefer a heavy coating of curry powder. NOTE: However, depending on how you intend to use the vegetables, you may choose not to season. For instance, if you plan to freeze your roasted carrots or sweet potatoes and then add them to smoothies, maybe just add a little salt and omit any further seasoning. Rub the oil and seasonings of choice into the vegetables and arrange into even layers so there isn't much or any overlap. Then bake until golden brown and tender (anywhere from 20-30 for cruciferous vegetables, onions, and garlic, and anywhere from 25-40 for root vegetables). Remove from oven and enjoy immediately on things like salads, bowls, in pasta salads and more! See the video below for inspiration. I like to freeze my roasted (or even steamed) carrots and sweet potatoes to add to smoothies throughout the week. My favorite way to use beets is blended into hummus. And roasted broccoli and cauliflower are perfect for grain bowls, pasta salads, and more. Enjoy when fresh, or store leftovers covered in the refrigerator up to 4-5 days. Reheat in a cast-iron skillet over medium heat, or in a 375 degree F (190 C) oven until hot. You can also freeze up to 1 month, but it's usually best to add these frozen roasted vegetables to things like smoothies, stews, and vegetable broth where their texture will be masked. *Nutrition information is a rough estimate for 8 (1-cup) servings of vegetables with 1 Tbsp oil and no salt or seasonings // make adjustments to nutrition information as needed when altering volume of ingredients). The way you made soup and adding roast veggies to a smoothie have blown my mind. Need to try. I am a horrible roaster (everything burns), maybe because we use fan assisted ovens here in the UK? I will keep experimenting. Gotta try this soup approach! I love roasted veggies and these instructions are spot on! I like making a large batch at the beginning of the week for a nice Sunday night dinner and then have left overs throughout the week. They are especially great with pesto sauce, but smothered in tahini is a close second favorite. I know you mention your curry powder but is there any other spices and herbs you would recommend for this recipe? I love curry powder but not for roasted veggies. We also really enjoy fresh rosemary with roasted veggies. Hope that helps! Delicious, colorful and it was a hit! Thanks for sharing your recipes! Recently, my husband was diagnosed with diabetes, it’s been a learning process. We’re more aware of vegetables now and I’m always looking to try new things! This recipe turned out beautifully. It was a side dish for Christmas dinner and it was well liked. Thank you for the recipe. Hi Jennifer. I often roast zucchini and yellow squash together. I slice them lengthwise about 1/3 inch thick and roast on 400 degrees for about 15 minutes sometimes 20 depending on the vegetable moisture content. I roast my zucchini in my panini press. I like my zucchini tender but not mushy, and this is perfect every time. I love frying Zucchini in a pan with butter for 5 minutes then putting so.e fresh sliced tomatoes on toppings g and then adding medium yellow cheese and melting it. One awesome side dish.